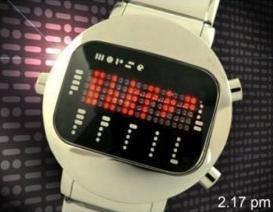 The Morse code watch from Tokyo telling time with three modes, either by using the built in speaker which sounds the time out with Mores code! or by pressing a button to see the Morse code on the LED , there is another button that enable you to see the time in regular. this watch is useful for those who are interested on Mores code and want to practise their brain.